One of my favorite projects as an engineering researcher involved DNA sequence analysis - analysis of the code that makes up life. Francis Collins, the leader of the Human Genome Project calls it “The Language of God” in his awesome book. This language is made up of words formed by only four letters, but writes the script for all of life! For Francis Collins, this language led him to Faith in Jesus Christ. Francis Collins is a great role model for me as one who believes in Jesus, but who also believes there is no conflict between the love of Jesus and the study of His creation through Science and Engineering. In the DNA sequence analysis project I was involved in we were studying how small sequences of RNA - microRNA - had huge impacts on gene expression and, when something in the sequence went wrong - disease. Our work looked at finding the important motifs, or patterns that had the most meaning and impact. One of the papers on our work can be found here. Putting these building blocks together into a sequence has helped our Mission of “Bringing People to Jesus!” When a person comes to faith in Jesus two major things happen. First they are saved - forgiven of all of their sins: Justified, with the status before God of being Just-as-if-I’d never sinned. Our first primitive building block in our DNA - the Alpha course - is aimed at helping people establish this saving relationship with Jesus Christ where our sins are forgiven because of what Jesus has done for us on the Cross, and through His Resurrection. Alpha is the most effective tool in our day for bringing the Gospel - the Good News of Jesus - to people, and helping them establish saving faith in Him. It is an amazing process that not only introduces people to Jesus, but also to a healthy, loving community of support as we launch together into the adventure of following Jesus. I am so blessed that we are an "Alpha Church!" The second thing that happens when someone encounters Jesus is that a sanctification process begins - the process of becoming Whole - becoming Holy. If Alpha helps the birth process take place, the second two ingredients of our DNA help a person grow up into the new creation God wants for them as relationship with Jesus grows deeper and faith grows stronger. Boundaries and Growth courses/small groups catalyze the sanctification process through administering truth and grace over time in a loving community. Like Alpha, this Good news of freedom and growth comes through people. The model is very similar to 12 step programs, but generalized so everyone can grow and benefit no-matter where we are in our walk, through safe small groups which help us process hurts and support one another through the challenges of life. 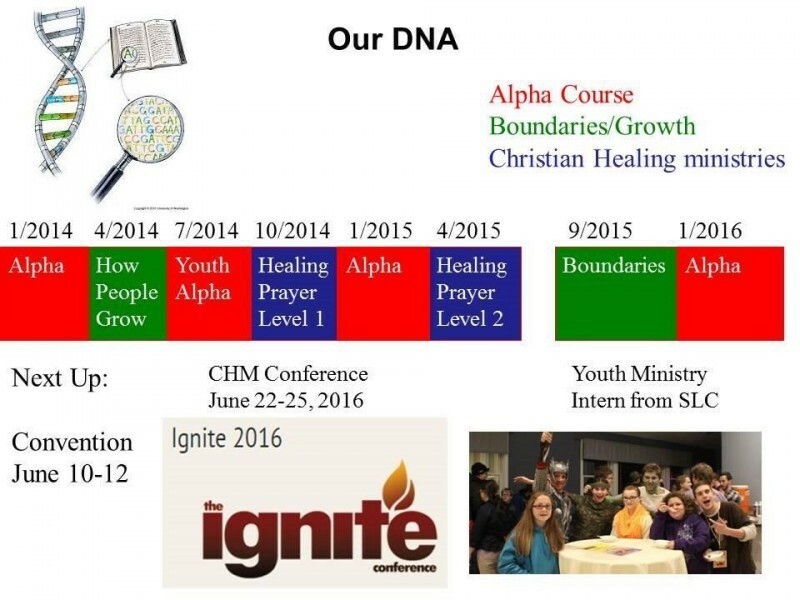 The third ingredient of our DNA is our Healing prayer ministry in the model provided by Francis and Judith MacNutt from Christian Healing Ministries. While both of the previous ingredients support Healing (Salvation in scripture can be translated as Healing, and the Process of healing that takes place in our boundaries and growth groups is profound) our CHM Healing Prayer ministry relies prominantly on the supernatural power of the Holy Spirit to heal the roots of our pain, to provide physical and emotional healing, and to deliver us from spiritual influences that seek to hold us back. Over the past two years we’ve been moving along an aggressive sequence of these courses. 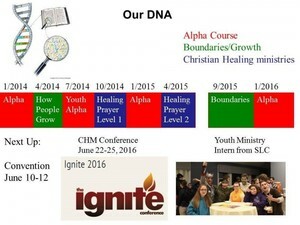 Through these three Adult Alpha courses, two Growth/Boundaries Courses, two Healing Prayer classes and our Youth Alpha that we have launched in the past two years we have not only had the opportunity to bring people to Jesus, but also bring ourselves and others to His healing and sanctification power. As I analyze our DNA sequence I see a model for moving forward that both brings people to Jesus, but also brings each of us and our Church and families to a place of greater Wholeness and health. If you think about it - we need each of these components. If we were to do only Alpha, how would we as individuals and as church work on our own issues and become more healthy? 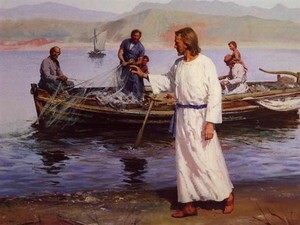 If we did only Boundaries/Growth or Healing Prayer, how would we fulfill Jesus call to “Go and make disciples?” If we did not arm ourselves with supernatural power to protect, heal and deliver how could we sustain the front line of ministry - evangelism, without harm; and how would we heal our deep hurts? What part of our DNA attracts you the most? We need everyone to bring their gifts and passions to these ministries if we are to fulfill our calling and for our church plant to grow. For 2016, consider stretching in a different area to learn, grow, and provide greater capacity for Jesus to use us for His Glory. They are all part of our core DNA, and the stronger the sequence we can bring with these building blocks the more meaning and impact we can have for our Saviour Jesus Christ! To Him be the Glory, now and for ever. Central to the Good News - the Gospel - is invitation! “Come and See” is a frequent invitation by the people of God to explore, go deeper, to investigate, and ultimately to meet God and establish a relationship with Him. The invitation is to everyone, and the result is relationship with none less than the Holy One of Israel Himself. Alpha: Alpha is a basic introduction to the Christian Faith which will run over 10 Tuesday evenings beginning January 5th. Join us for a Free dinner to see if Alpha is for you! Polar Express: Join us for a movie matinee on Wednesday, December 30th at 2pm in the Parish Hall for a time of Fellowship and Fun! And finally, our Christmas Eve Service on Thursday, December 24th at 7:40pm or any of our Sunday Celebrations at 9:30am are a great way to get connected and begin the journey. You're Invited! It would be our great pleasure to bring you to Jesus. It would be a wonderful pleasure to Bring Jesus to you. Come and See! We are blessed to be Recieving 7 people into the Anglican Communion this coming Sunday and Confirming 3 people! For those being recieved this event serves as a renewal of this proclamation they have previously made and an official welcome into the Anglican Communion. We welcome Bishop Herzog to preside over this glorious occasion. Please pray with me that all those being received and confirmed are filled to the measure of all fullness with God and experience a new Pentecost as thier relationship with our Lord and Saviour Jesus Christ Flourishes! We had an awesome Memorial Day Service in Round Lake Village on May 25th to honor those who gave their lives for our country. Great speeches, wonderful mens choir, and I got to pray the Benediction - see below. Afterward two atheists in the National Guard came up to thank me for reaching out to them - it was a really neat moment. I love this country! What a blessing to live in such freedom and diversity! Benediction means “Good Word,” and I thank Dominick for the opportunity to offer a Good Word to send us off today, as we complete this ceremony in Round Lake village honoring those that gave their lives in wars for our country. My Good word will take the form of a prayer in the name of Jesus. I do this with great respect for the other faiths that are represented here and for those who thoughtfully choose to have no faith. 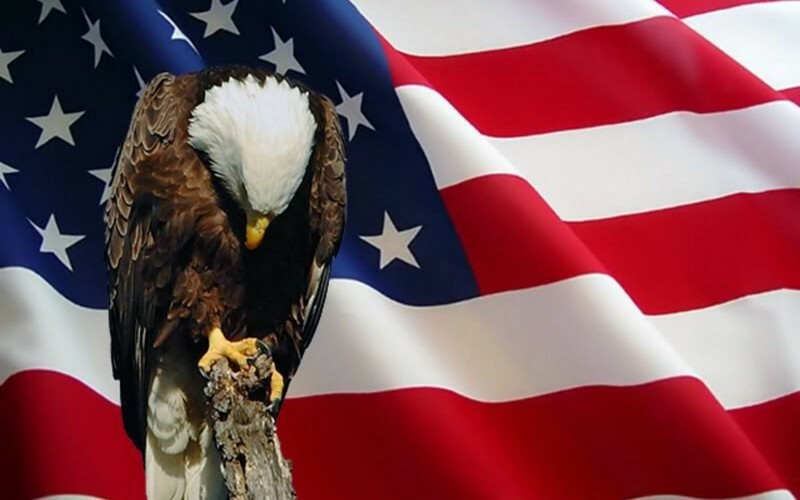 The very lives we honor today were given fighting for a country founded on the basis of diversity and religious freedom, – as Abraham Lincoln said in his Gettysburg Address we are “conceived in liberty, and dedicated to the proposition that all men are created equal.” We are a country for which it may be said our task is to reconcile diversity with unity. We look forward to a time when there will be “No more crying and no more pain,” (Rev 21:4), and when we will “Beat our swords into plowshares and spears into pruning hooks. (when) Nation will not lift up sword against Nation. Neither shall (we) learn war anymore” (Isaiah 2:4). “Lord Jesus, I thank you for the men and women we honor here today who, knowingly or not, followed your most important commandment – showing love for which there is none greater: giving up their lives for their friends. We pray for their widows, orphans, and those they left behind, that you would comfort those that mourn and show us how to care for them. We pray that as Lincoln said, that these men and women will not have died in vain. That Our Nation, under God, shall have continued transformation of Freedom and unity. And that as you have prayed we will ultimately, with all of humanity, be one, as you and the father are one. Your will be done, your kingdom come on earth as in Heaven. We had fun on Sunday exploring one of the central tenets of Easter: Resurrection of the Body, complete with a Dixieland rendition of "When the Saints Come Marching In." If you missed service unfortunately you won't be able to hear the sermon because my recording malfunctioned and was unable to be resurrected. (Note to Don Moore - need to get our AV Team rolling :-)). But the good news is that you will be Resurrected! 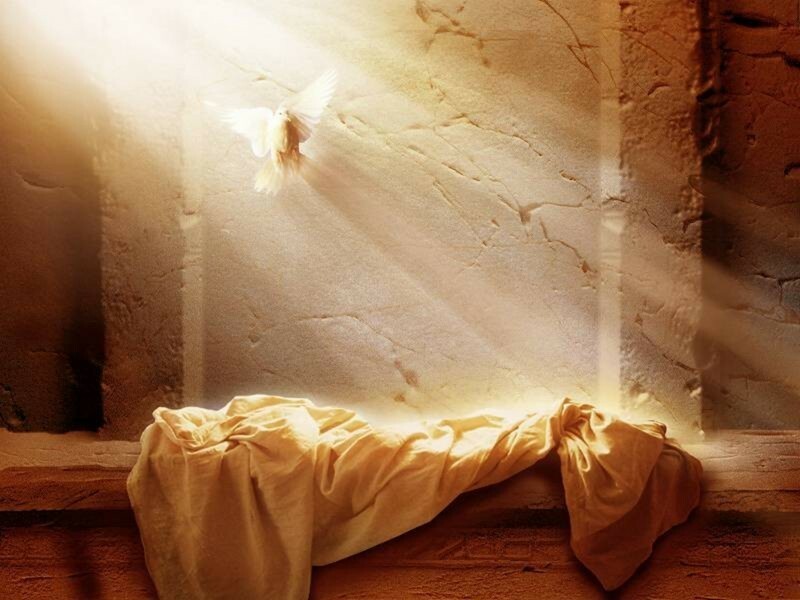 The message of Easter is all about the Resurrection - how Jesus' Resurrection and defeat of death points towards our own resurrection of the body, and how it is Personal, Perfect and Perpetual! This reality has awesome implications for how we live our lives today. When we pray for healing we are asking for a foretaste of that perfection now! When we care for our planet we are driving towards the New Creation Now! When we heal our relationships we are sharing the very personal salvation we have received with the extended family that will live perpetually with Jesus, when "His Kingdom Comes, His will (is) done, on Earth as it is in Heaven." What part of your life needs resurrection this Easter season? Is it physical or emotional healing; relational, circumstantial.....is it a hope or dream. Whatever the need, as we move through Easter towards Pentecost, I pray that you receive a foretaste of the Resurrection of the Body in the form of as much healing, reconciliation, and living water welling up to eternal life as you can handle!